Restaurants and bars can be huge parts of the culture of a city. As has often been written, eating is one of the few things we all must do, so it’s natural that restaurants have evolved into social gathering places for friends, families, and visitors. It’s in the diversity, quality, and experiences of those restaurants and bars that a community can sometimes find its sense of place. These places are often where you find the “vibe” of a town. At Volume One we’ve always been passionate about the restaurant scene, and have done our best for more than 16 years to introduce thousands of residents and travelers to both new and long-time local favorites throughout Eau Claire, Menomonie, Chippewa Falls, and points in between. Last September, with the input and partnership of dozens of area restaurants, we launched the Chippewa Valley’s first Restaurant Week – 10 days of special menus, deals, events, and contests that drew several thousand people hungry for something fresh in our dining scene (and we’ll do it all again this year, Sept. 21-30). 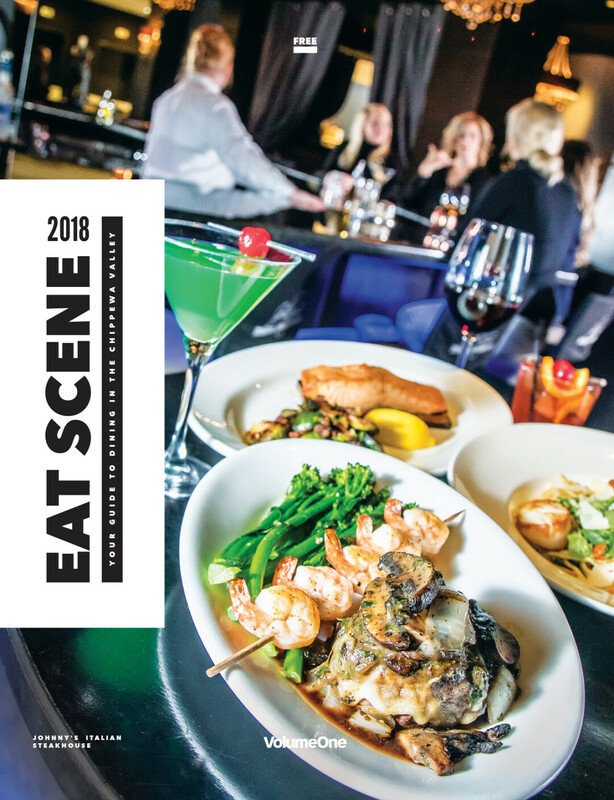 Well today, tucked here inside this issue of Volume One, we release the all-new and improved Eat Scene / Night Out guide. After more than 10 years working on this publication, we’ve made another big investment into the restaurant community by upping the quality, look, and usability of the guide from back to front, in both print and online. It’s in a handy, keep-around magazine format here, and in a searchable and filterable format for both desktop and mobile on our website at VolumeOne.org/restaurants and VolumeOne.org/bars. We challenge you to use these guides to re-explore your surroundings. Find a place you’ve never been. Maybe even take a short road trip. In general, get outside your comfort zone and experience something new. It’s good for you, good for the establishments, and good for the community. We’ll see you out there.